John Whitten Van Cleve (1801-1858), son of Benjamin and Mary Whitten Van Cleve, was one of the first white children born in Dayton. John was born on June 27, 1801, five years after his father had arrived at present-day Dayton. John would become locally noted for his literary, scientific, and artistic achievements, and his life-long and unpaid work for the public good. John was a born scholar, endowed with a vigorous intellect and a facility for acquiring knowledge of both mathematics and languages. John entered Ohio University at Athens when he was sixteen years old. He established quite a reputation for his scholarship at the university; he was a teacher of Greek and Latin at the university before graduating. Upon his graduation, John studied law with Judge Joseph H. Crane, and was admitted to the bar in 1828. John’s political career included serving elected terms as recorder in 1824 and 1828, as well as three terms as Mayor of Dayton between 1830 and 1832, and he was several times the city engineer. In December 1828, John purchased an interest in the Dayton Journal, which he edited until 1834. John was also involved in the drug business, in partnership with Augustus Newell, their firm being Van Cleve & Newell. Van Cleve & Newell was on the north side of Third Street, just east of Main. 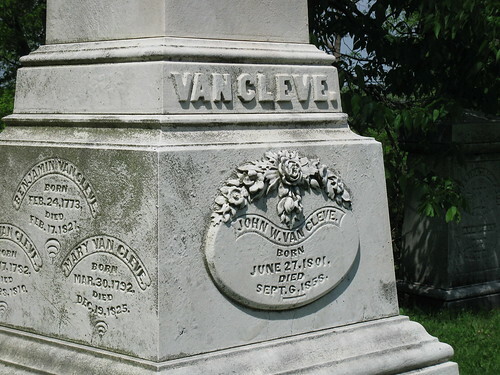 In his later years, John W. Van Cleve became an accomplished musician, painter, engraver, civil engineer, botanist, and geologist. John was a founder of Woodland Cemetery, being president of the Woodland Cemetery Association from its inception in the early 1840s until his death. In 1847, John also became one of the founders of the Dayton Library Association, which would eventually become the present-day Dayton Metro Library system. John W. Van Cleve died from tuberculosis on September 6, 1858, in Dayton. His funeral was held the following day at the Phillips House, and he was buried inWoodland Cemetery, Dayton. He had no spouse or children. This biographical sketch was originally written by Lisa P. Rickey and Jared Baldwin in April 2010 for the Van Cleve-Dover Collection (MS-006) finding aid at the Dayton Metro Library, 215 E. Third St., Dayton, Ohio, 45402; phone (937) 496-8654. Additional information about the sketch’s subject can be found in that collection and in the citations below. Please contact the library or this blog’s author for more information about how to access the original finding aid or the manuscript collection. Obituary of John W. Van Cleve, Dayton Daily Journal, September 7, 1858, page 2.